This post is the first of two posts recapping a meetup from January 2019 at Getsafe HQ in Heidelberg, Germany. A video recording of the presentation can be found here. “Define the vision, own the strategy, ship great products” — these are perhaps some of the most commonly uttered phrases in any product management (PM) job description. While they do capture much of the essence of what PM entails, those of us who are less familiar with PM as a discipline may find words such as “vision” or “strategy” a bit abstract and difficult to relate to. If this feeling resonates with you, I’m glad you’re here! In this post, I will walk through some of my thoughts on the importance of product visions and provide a brief guide on how to go about creating one. I do not dare claim to be a vision-master in any way as there is always so much more to learn. Thus, I am happy to receive feedback — we can have a discussion. Let’s use an analogy to make things a bit more concrete. Suppose I would like to plan an exciting Christmas getaway with my girlfriend this year. I’ve often heard from friends about how Strasbourg turns into a magical place during this time of year with its elaborate Christmas market. So I begin planning a trip from Heidelberg to Strasbourg by pulling up Google Maps to start scoping out how I would go about getting there. After a quick dance with the loading spinner, Google Maps presents me with many different options for how to get from Heidelberg to Strasbourg, including going via car, transit, or even bicycle. Each transportation mode comes with several different routes that I could take, depending on my preferences. 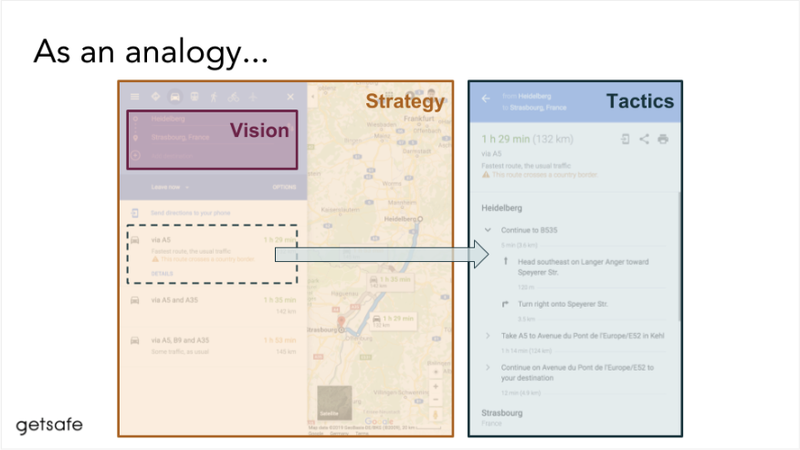 This user interface captures the essence of “vision” and “strategy” very well. In this case, I have the vision of “an exciting Christmas getaway in Strasbourg,” and Google Maps helps me understand the various strategies I could employ to get there (i.e., mode of transport and route). Just like in the realm of products, there are often several different routes that one could take to arrive at a single destination. We can continue expanding on this analogy by choosing a transportation mode, then selecting one of the routes. At this point the user interface outlines detailed turn-by-turn directions for the route that I have selected. These steps represent the tactical featuresor milestones that I must achieve to stay on course with the selected strategy: in order to follow the route that Google Maps recommends for driving from Heidelberg to Strasbourg, I need to carefully follow each turn that it prescribes. Another way tactics play into this analogy could be ways to prepare for the trip so as to minimize the need to stop along the way, such as filling up the gas tank before leaving, or bringing lunch to-go. 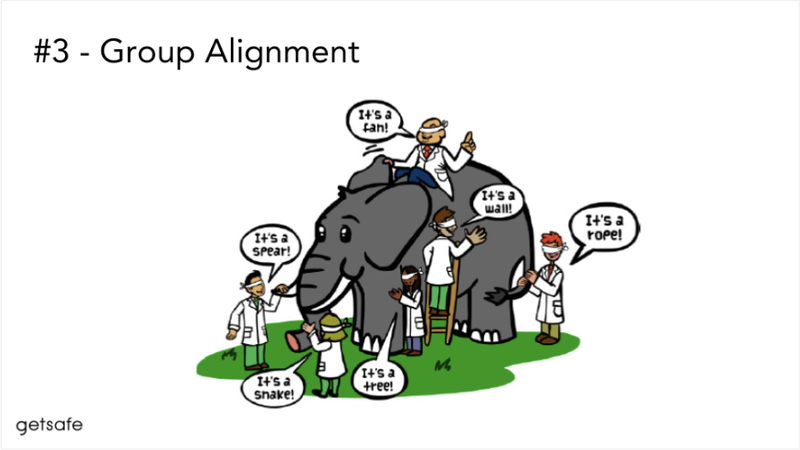 The message here is simple: to properly execute against a product strategy, we need to utilize the right tactics and make sure they add up to something bigger. This quote has always stuck with me because it captures the idea that innovation always starts with someone who believes they can create something and change the world. In order for me to have an amazing Christmas getaway in Strasbourg, I need to first have the idea of going on such a trip, and then believe enough in it to then act on it. Similarly, in order to create a new product that moves humanity forward, someone must first come up with an idea of how to do so and then act on it with conviction. As children, one of the school games that left the deepest impression on me was “Telephone,” where the teacher lined up all of the students in a single row and then whispered something into the ears of the first student. Then, the teacher instructed this student to pass on the message by whispering into the ears of the student immediately next to them. This process repeated until the last student in line finally received the message. The teacher then asked the last student to say out loud what was whispered to them, and it was always surprising how different what the last student reported was from what the teacher had initially said to the first student. This game has always stuck with me because it taught me a very simple yet important lesson at a young age: communication is hard. It is especially difficult at scale, where complex ideas must be conveyed across many different teams and organizations. Within the context of a tech start-up, how can we make sure that the vision our founders have in their heads is clearly understood by the entire company so that we can collective execute toward this common end goal? This is where the product vision comes in — as a team, it is crucial for us to develop a clear and concise vision that conveys the essence of our shared end goal. We should then regularly use this vision in our communication to maximize the chances of everyone understanding the same version of the vision. Each word in the vision statement should serve a specific function toward guiding the team, rather than needlessly adding complexity or further diluting the message. If we do this well, any single team member should be able to articulate an understanding of the vision that matches what the founders had in mind when they founded the company. As companies grow, the responsibilities of team members tend to become increasingly specialized over time. On a day-to-day basis, this means that people will spend most of their time working on a specific part of the vision and become an expert in that area. While this phenomenon is an important part organizational evolution, it is important that each team member retains an understanding of how their part fits into the overall collective goal. A well-crafted and clearly communicated product vision can serve as an important tool for aligning groups and empowering team members to make better decisions independently. 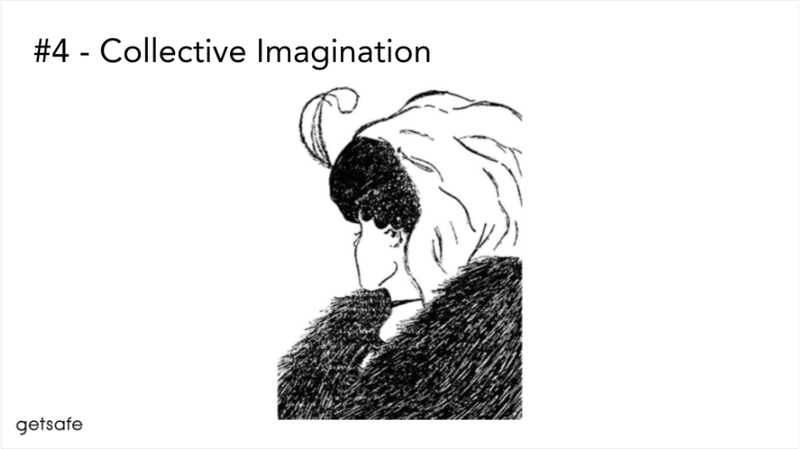 I really like this illustration because it demonstrates the idea that different people can have varying perspectives on the same reality. Because of this, a product vision is often the single most empowering tool you can give to your team. 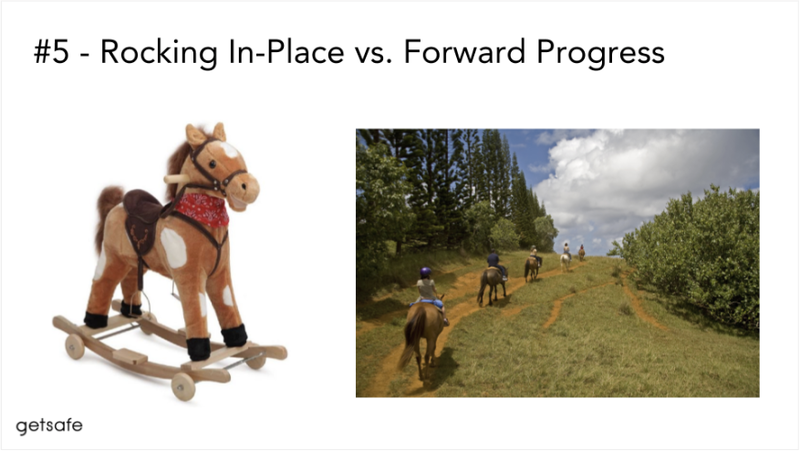 Given the same end goal, every team member may have a slightly different view on it, enabling them to then use their own imagination to work toward it in a slightly different way. Thus, a well articulated product vision can be the key that unlocks the maximum potential of your team. When this is done effectively, the collective intelligence of the group will always outperform any individual person regardless of how smart that person may be. The product vision is the end goal of our journey, therefore it is naturally the single most valuable reference point for differentiating motion from progress. If we ride a horse with our eyes closed, it would be difficult to tell whether we are getting closer to our final destination or not. Conversely, if we know where we want to go and do a pretty good job of keeping our eyes on the prize throughout the trip, we will have a much better idea of whether we’re getting closer to the end goal with each milestone that we achieve. 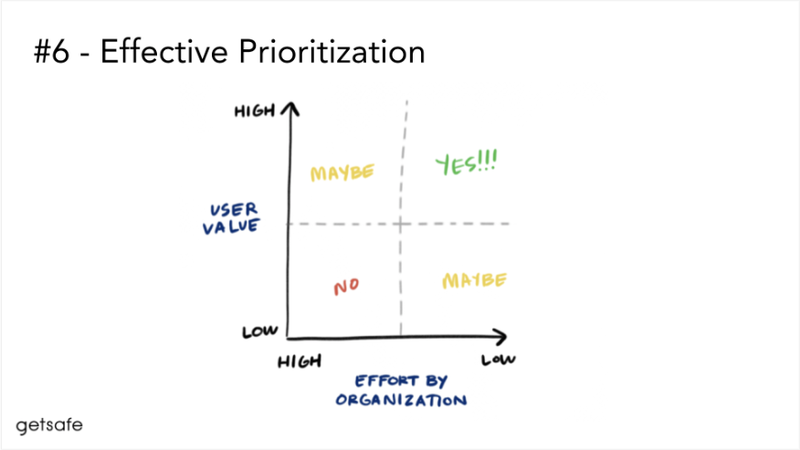 This framework provides a quick and simple way for us to articulate tradeoffs between ideas and make sure we are focusing on the things with the most impact for our customers. Similar to #5 above, a product vision is a prerequisite for articulating the amount of “user value” that any given project delivers because everything we do should slightly improve the status quo and move the world closer to the new reality that we’re trying to create. The product vision serves as a crucial reference point for identifying which ideas have the most potential to deliver impact. Hopefully, you’re now convinced and eager to start creating a product vision of your own. The next section discusses some tips for how to go about doing so. How do I create a product vision? Vision is about telling a story. As I continued working in product over the years, I’ve found this advice very helpful for articulating product visions as well. Within the context of storytelling, your last line is your end goal. It is how you want to leave the world when you are done. Similarly for product, your vision is what you ultimately want to achieve. It is the summary of how you envision the world looking like when you have finished creating what you’re creating. At this point, we get into some territory that can be tricky to explain because there isn’t really a “right answer” for how to go about coming up with great product visions. There isn’t a checklist of specific tasks to complete that will ensure you have a 100% success rate for creating world-class product visions. Similar to telling a story or writing a novel, product visions can require lots of imagination and creativity, and inspiration for doing so can come from anywhere. Thus, the approach I would like to take in this article is to introduce some sources of inspiration that I have found helpful over the years, then provide some structure for how to organize them. 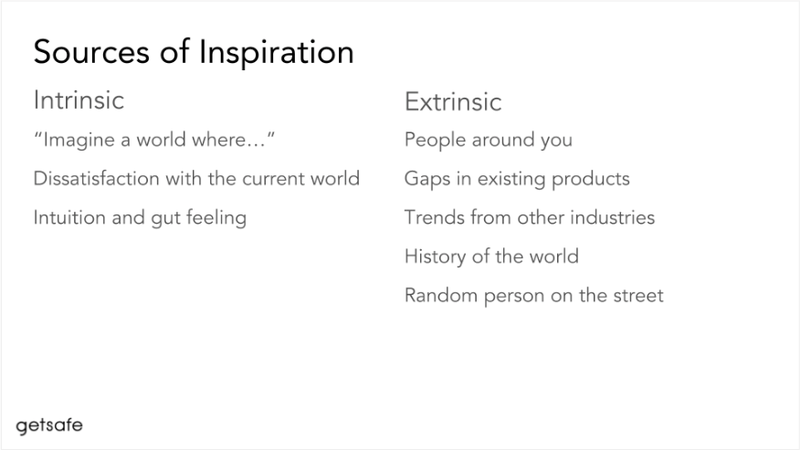 There are two primary buckets that I categorize sources of inspiration into: intrinsic and extrinsic. “Imagine a world where…”: A vision can be as simple as starting a sentence with “imagine a world where…” and then seeing what comes out when you try to finish the sentence. Dissatisfaction with the current world: When was the last time you felt like something about the world just could be better? What didn’t feel right about it? How would you make it better if you had a magic wand? Intuition and gut feeling: Sometimes we just have a feeling that something is off and could be improved. Explore these feelings and try to get to the bottom of them. 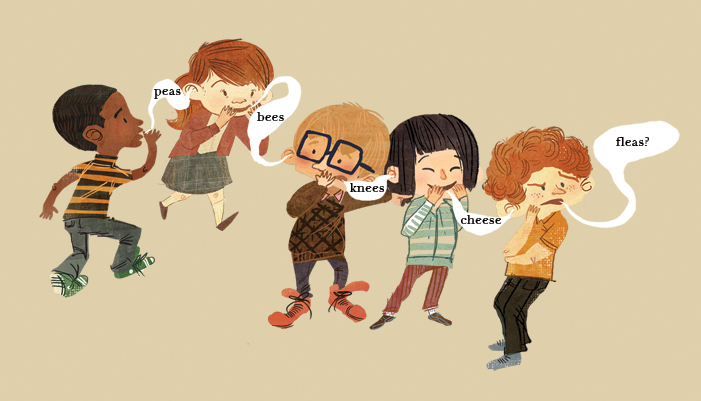 People around you: When was the last time someone you know said something smart? 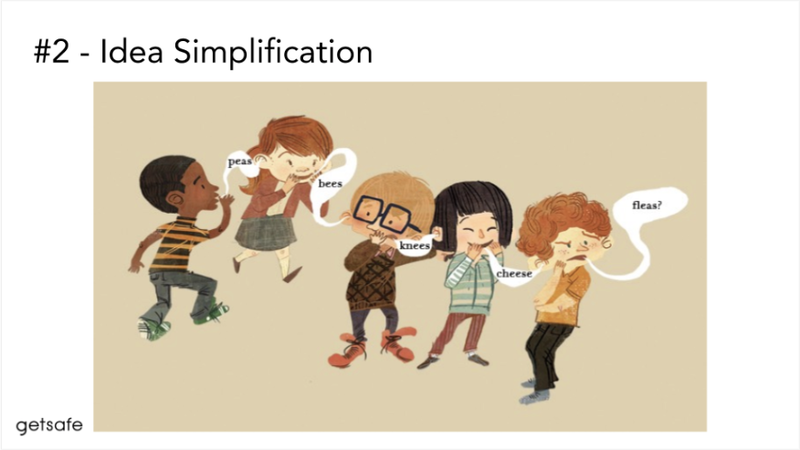 How might you expand on those ideas and integrate them into your product? Gaps in existing products: What does the competition look like? Are there any customer segments that are underserved? Trends from other industries: Are there other industries that are going through similar changes? For instance, how might we compare and contrast InsurTech to FinTech and/or e-commerce? History of the world: Are there past events that vaguely resemble what’s happening in your product area? For example, what parallels can you draw between the rise of manufacturing and the rise of automation? Random person on the street: Basically, extrinsic inspiration can come from anywhere. Perhaps the most important thing is that we pay attention and take time to reflect a bit when we find something interesting. I recently re-watched “Forrest Gump”, one of my all-time favorite films. In case you haven’t seen it, Forrest is a boy who lived in rural Alabama with his mother. They lived on a big farm house and rented out the extra rooms to travelers in order to make ends meet. One time, a musician stayed over for a few nights and Forrest had a great time dancing to the upbeat guitar music this guest played. The musician kept asking Forrest to repeat his dance moves because the braces around Forrest’s legs forced him to dance in a very particular way that was quite different from anyone else. Years later, Forrest and his mother saw this musician on TV and finally learned he was Elvis Presley. 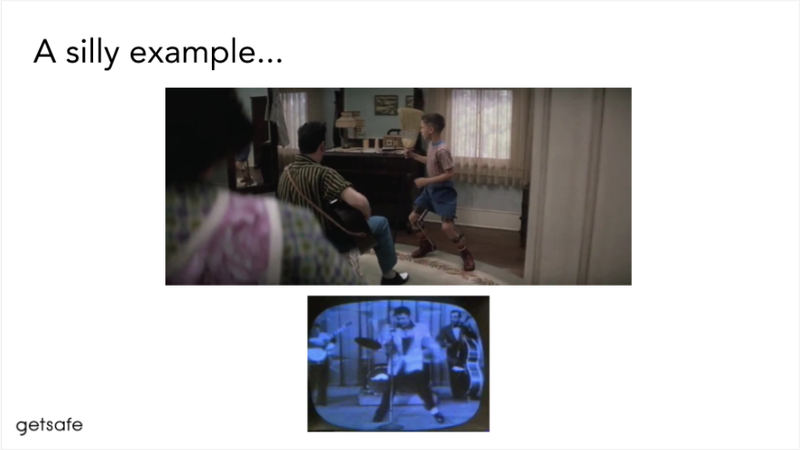 Elvis was performing on a stage and his dance moves closely resembled Forrest’s style as a boy. Visions can come from anywhere. If we pay close attention to the world around us and are thoughtful about identifying and integrating new ideas into our own work, often times we will be able to create something great. Now for a more serious example, I would like to refer to Steve Jobs’ keynote presentation from 2007, where the original iPhone was officially announced. The whole video is over an hour long, but we will only refer to the segment between 3:00 and 7:40. If you feel comfortable, please share your visions in the comments section; we would love to see what kind of great ideas you have, let’s have a discussion. Curious about how we are applying these ideas to real products? 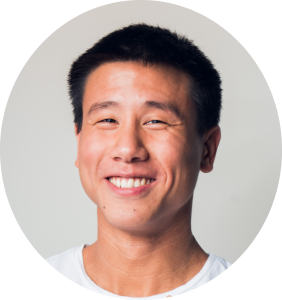 Follow Patrick Tsao and stay tuned for the next post, which will include a deep dive into how we used the tools mentioned here to formulate the product vision at Getsafe. Patrick Tsao is currently the VP of Products at Getsafe. Previously, he worked in product at Uber, where he focused on maximizing the effectiveness of Uber’s operations teams around the globe. He started his career in product management at Redfin, a technology-powered real estate brokerage, where he led efforts to create Redfin’s CRM system and data platform. He grew up in Taipei, Taiwan, and studied Computer Science and Business Administration at the University of Washington in Seattle. In his spare time, he enjoys music, tennis, traveling, and also dabbles in scuba diving.